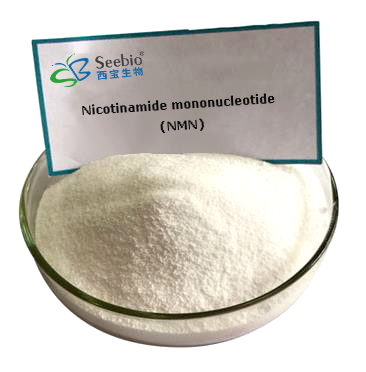 Nicotinamide mononucleotide ("NMN" and "β-NMN") is a nucleotide derived from ribose and nicotinamide.Like nicotinamide riboside, NMN is a derivative of niacin, and humans have enzymes that can use NMN to generate nicotinamide adenine dinucleotide (NADH). Nicotinamide mononucleotide (NMN) is proved by Harvard scientists to reverse aging process and may be new alternatives to aging, type II diabetes, cancers, muscle wasting and inflammatory diseases within five to ten years. NMN increase the NAD+ level in the body.Then, all the modes of acts of NMN is to be the mechanism of NAD+. β-Nicotinamide mononucleotide is a product of the extracellular Nicotinamide phosphoribosyltransferase (eNAMPT) reaction and a key NAD+ intermediate. It ameliorates glucose intolerance by restoring NAD+ levels in HFD-induced T2D mice. It also enhances hepatic insulin sensitivity and restores gene expression related to oxidative stress, inflammatory response, and circadian rhythm, partly through SIRT1 activation. NMN was able to repair the DNA in cells damaged by radiation. cancer, Alzheimer’s disease, Parkinson’s disease, and many more.